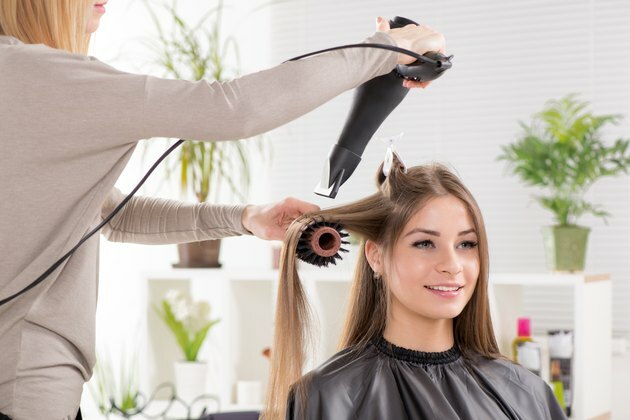 A keratin treatment, sometimes referred to as "The Brazilian Blowout," is a way to get the smooth, volumized hair you want without hours of blow drying and straightening each morning. A keratin protein formula is heat-infused into the hair to keep it straight for up to three months. By caring for your keratin-treated hair properly, you can extend the life of the treatment so you enjoy more weeks of super styled, effortless hair. However, this too-goo-to-be-true process may not be worth the risk. For the first 72 hours after your keratin treatment, washing, swimming or even getting wet in the rain is forbidden. The water can penetrate the hair shaft, trapping the moisture inside and causing frizz. You won't get the smooth results that you hoped for and may even experience multitextured hair, depending on where the water affected your hair. Wear a hat to protect your hair. A keratin treatment is especially prone to creasing in the first 72 hours after treatment, so you need to avoid using ponytail holders, hair clips or barrettes until the treatment has set. To style your hair in the first 72 hours, you only need to brush through the hair to maintain the right style and shape. When you do start to wash your hair again, the fewer times you wash, the longer your treatment will last. Switch to a dry shampoo to stretch your time in between washings or consider change to a sulfate-free shampoo. Sulfates make for powerful detergents, but they can also strip the hair of the keratin protein so your results don't last as long as they could. Because your hair is coated in keratin protein, you shouldn't need to use mousse, gel and hairspray to tame your hair into the right shape and style. Styling products can cling to the hair and leave residue behind. The fewer styling products you use, the less build-up and the less you need to wash your hair. It ensures your keratin treatment stays looking fresh and smooth longer. A leave-in conditioner is an integral part of making your keratin treatment last as long as possible. After you've washed your hair, dry it by patting it with a towel. Then, spritz a leave-in conditioner over your hair and dry it as usual. This helps to infuse the hair with moisture to keep your keratin treatment looking frizz-free and healthy. Keratin hair treatments, like all hair treatments, are unregulated. Formaldehyde, a prominent ingredient in keratin treatments, has been classified as a suspected carcinogen by the Environmental Protection Agency and the Occupational Safety and Health Administration, according to an article at the Oprah.com website. Use a trusted hair stylist, inquire about the ingredients in the process and don't repeat the process often.